Quinoa is considered a superfood. It is known for its high protein, fiber and minerals. I love Quinoa as it is a complete protein and try to include it in my diet now and then. It has all nine essential amino acids our body needs. As it is very rich in protein, it's perfect for vegetarians and vegans. Moreover it doesn't contain any gluten. It can be had for lunch, dinner or can be packed for office or school lunch boxes. Today we will learn how to make Quinoa Tomato Bath/Pilaf following this easy recipe with step wise pictures. 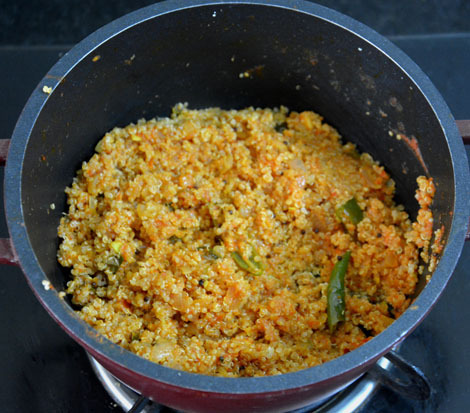 Cook quinoa as given in the link - How to cook Quinoa. Fluff it with a fork and keep it aside. Grind/blend 3 ripe tomatoes and keep it ready. We need 1 cup of tomato puree. Chop onions, ginger and garlic finely. 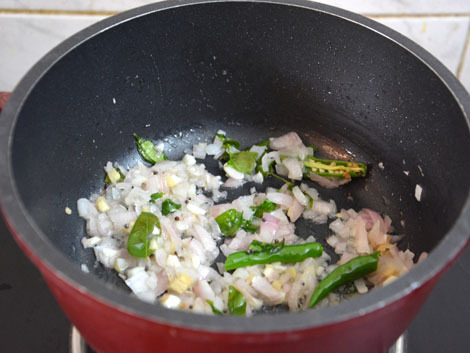 Heat oil in a pan, add mustard seeds, when it splutters, add curry leaves, onion, ginger and garlic. Add little salt and saute until onions turn transparent. 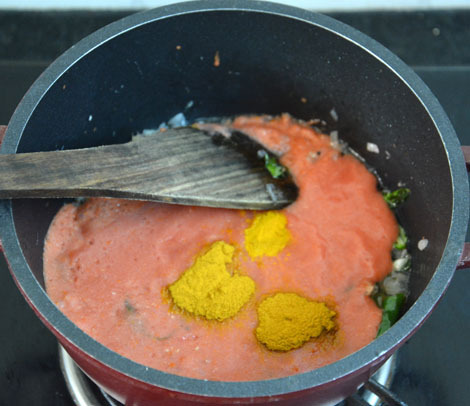 Add tomato puree, sambar powder, turmeric powder and salt needed. (we have added salt while cooking the onions, so add accordingly). 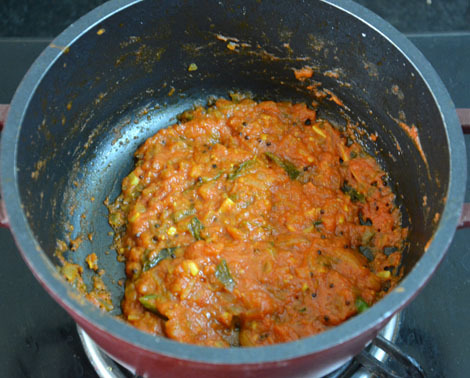 Cook until the rawness of the tomato goes and it oozes out oil. See the difference between the picture above and below. Cook the tomatoes well like that on medium flame stirring from time to time. 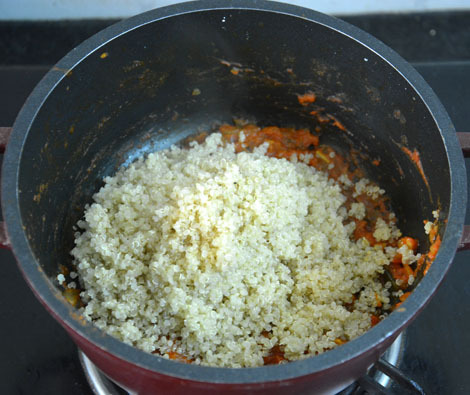 Once the tomato puree is cooked well as shown above, fluff quinoa with a fork and add to the tomato mixture. Mix well until the quinoa is well coated with the tomato mixture. Check for salt and remove from heat. Garnish with finely chopped coriander leaves. Serve hot with any raita or pachadi or salad of your choice. It will take only 15-20 minutes to prepare this dish. While the quinoa is cooking, you can make the tomato gravy and save a lot of time. Suggestions - You can add cooked peas and top it with mixed toasted seeds to make it more nutritious. 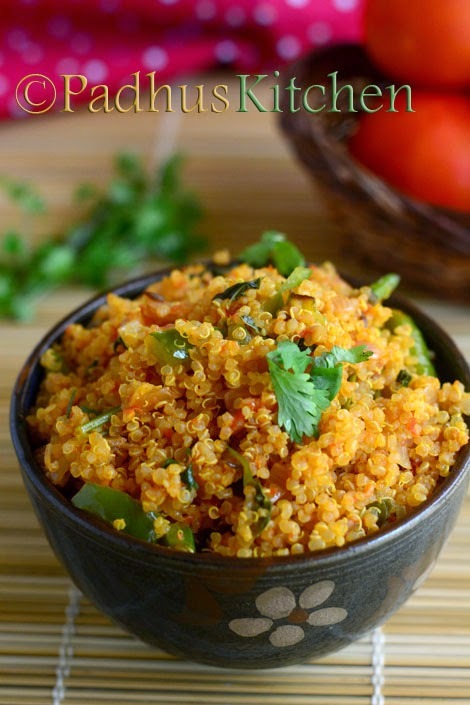 Tips for working women -You can prepare both quinoa and the tomato mixture a day before and refrigerate it. The next morning all you have to do is to mix both and reheat it. hi. I just tried this recipe and it was so tasty. My hubby loved it. Thanks for such brilliant recipe. Lovely picture. I love the way you present the recipes. Best wishes. There is no tamil name for it. It is called quinoa only. Check in the imported section of big super markets.